Can the Corp choose an unrezzed piece of ice for Project Kusanagi's ability? Yes, but it won’t do anything because unrezzed ice cannot have subroutines. 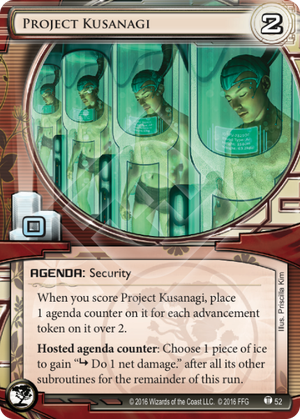 Note that the Corp can only activate Project Kusagani’s ability if there is a rezzed piece of ice somewhere: to activate the ability, it must have the potential to change the game state, but once the ability resolves the Corp is not required to make a choice that actually changes the game state. What a wonderfull card! Although having zero-point agenda may look weird at first because what player would want keep his agenda density high? Till that point there was only one attempt in creating such agenda Domestic Sleepers, however after paying 3 it transformed into 2/1. Now we got another 2/0 agenda, this time for Jinteki. Play on table, left unadvanced - one additional decision for Runner and even if he access - 1 damage and 1 worthless agenda in score area. Draw with Jackson Howard and try to put 3 copies of Kusanagi in Archive. Additional decision for Runner - to put in on Film Critic or not? PK with 3 or 4 counters (I know, difficult) : It's a Trap! or even better Kitsune + Snare! And of course at the end of the day this card is obvious choice for every "Ghost in the shell" fan!